For many anglers, sharks represent one of the sport’s greatest challenges, with the added bonus that unlike marlin or swordfish, you don’t have to leave British waters to hunt for them. What Sort of Sharks Are There In British Waters? There are more than 20 species routinely found around the British Isles, ranging from the Lesser Spotted Cat-shark ( Sycliorhinus canicula ) – formerly known as the Lesser Spotted Dogfish – up to the 11 metre Basking Shark (Cetorhinus maximus), though you won’t be catching this legally protected plankton-eater on a rod and line! Around half of the species are permanent residents in British waters – including both of the above mentioned sharks as well as the likes of the Porbeagle (Lamna nasus), while others such as the Blue Shark (Prionace glauca) and Short Fin Mako (Isurus oxyrinchus) are migrants, passing through on their annual trans-Atlantic voyage. Where Can I Fish For Sharks in the UK? 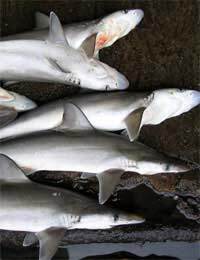 Some kinds of British sharks, such as the Greater and Lesser Spotted Cat-sharks (Sycliorhinus stellaris and S. canicula) are to be found all around our coasts, while other species are more localised. The main shark fishing areas tend to be on the southern and western Atlantic coastline – especially South and West Wales, Devon and Cornwall – although there is good sport also to be had in the English Channel and Western and Northern Scotland too. What Fishing Techniques Are Suitable? Trolling – towing a baited line or special lure behind a boat; this is typically used to catch pelagic (open sea) species such as the Porbeagle, with the hook drawn fairly shallowly through the water, though some anglers troll deeper to attract other kinds of shark. Fishing at Anchor – the main advantage of anchoring the boat is that it allows the bait to be placed very precisely, which can be useful when fishing a reef, wreck or other known shark haunt. However, it is not for the faint-hearted, since fighting larger and more active species from a fixed boat, rather than one which is free to move with them, is often considerably more exhausting. Beach fishing for sharks is also possible and many of the smaller sharks can often be caught from the shore or pier – and there are even some cases of Porbeagles being taken in this way! There was a time when sharks were routinely killed and brought back to harbour for the obligatory photo of angler and trophy, but these days, with many species of shark becoming increasingly rare, the catch and release policy has been adopted to safeguard the future of the sport. Many shark-fishing charter boats now participate in a tagging scheme which helps marine biologists study these fascinating creatures – giving a new and valuable conservation role to sport fishing. Although it largely depends on what you’re hoping to catch, there are some particularly good general baits to use. Mackerel, either as whole-fish or strips, depending on the size of your intended prey, seems to be the universal favourite amongst British sharks, with only the crustacean-favouring Smooth Hounds preferring their more traditional diet of crabs. Other good choices include squid, herring and cod. Do You Really Get Great White Sharks Off the British Coast? Over the last ten years or so, the possibility of a British “Jaws” has periodically made newspaper headlines, with alleged sightings of Great White Sharks (Carcharodon carcharias) off the coast of places as far apart as Cornwall and Shetland. Most of them have subsequently been explained as mis-identified Basking Sharks or Porbeagles. Although the water temperatures and conditions around Britain are perfectly suitable for Great Whites and this species has a well-established reputation for long-distance travel, to date there are no authenticated records of them in the seas around the UK. There are probably two main reasons for this. Firstly, they are becoming increasingly rare globally, which automatically reduces the chances of a “stray” wondering along our coasts. Secondly, although they do eat seals when the opportunity arises – and at times, people too – generally they are fish-eaters, especially when young; many believe that our reduced fish stocks would simply not be able to sustain a population of Great Whites. However, although unproven, it’s certainly not impossible! Shark fishing isn’t for everyone; the equipment can be expensive, the conditions challenging and the physical effort demanding – but if you’re looking for an angling experience which takes you face-to-face with nature in the raw, it’s definitely worth considering.